I haven’t been a member of a Labour affiliated union for nearly ten years now – my current union don’t even have a political fund, let alone one that affiliates to Labour, but something really irks me about the latest Tory billboard – criticising Labour for taking union money (no, the one above is my take on it, not the original, which you can see here). If the Tories are honestly able to believe Michael Ashcroft wants to give them his tax-dodge savings purely out of civic duty, rather than attempting to buy any kind of influence, it should hardly be too big a leap of faith that millions of union members might voluntarily give small change every month to Labour, collected through their unions. It’s not because they want Derek and Tony to lean on Gordon in industrial disputes or that they think it will get them all a pay rise. It’s for the same reason that the unions started the Labour party. The party is a part of the labour movement, and it represents the interests of the ordinary working majority in the UK. Members of around a quarter of UK unions give funds to Labour in this way, and for this reason. 83% of Unite’s members seem to think that giving working people a stronger voice in politics is worth getting together and pooling a few pence a week. 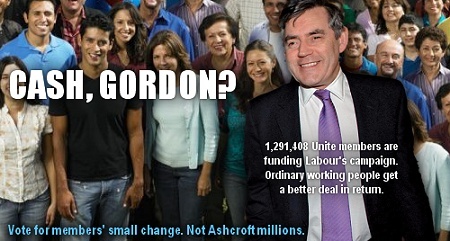 I think that’s pretty honest cash, that Gordon should be proud to be able to call on. UPDATE 19/3/10: Carl has some good points on union party funding at Stronger Unions.